Wow! 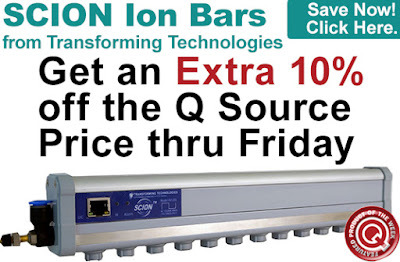 An Extra 10% off Transforming Technologies SCION Ion Bars All Week Long! This week we’re featured Transforming Technologies’ new SCION Ion Bars with an extra 10% off our regular low prices at QSource.com. To take advantage of this discount, just add an eligible ion bar to your shopping cart. Offer is valid Monday, March 19, 2018, through Friday, March 23, 2018. These SCION Ion Bars uniformly eliminate static at high speeds in mini-environments, laminar flow hoods, and wide area workstation applications. They are effective tools for electronic, plastic, chemical, printing, textile, optical, and other industries. Click here to purchase promo-eligible SCION Ion Bars from Transforming Technologies. For further questions, call us (800-966-6020), or send us an email. Please note: This promo is valid only at QSource.com.